Outdoor Kitchen Hamptons fabulous. There is a difference between Outdoor Living and Living Outdoors Fabulously and that is by DESIGN. Outdoor Living fabulously designer and founder of THE OUTDOOR KITCHEN DESIGN STORE Michael Gotowala shows us the secret to success for living beyond the walls of your home outdoors. The idea at hand is to understand the intent of the space and transcribe some of the comfort levels of each family members lifestyle indoors and extend upon it outdoors. The result becomes endless hours of time spent outdoors with friends and family. 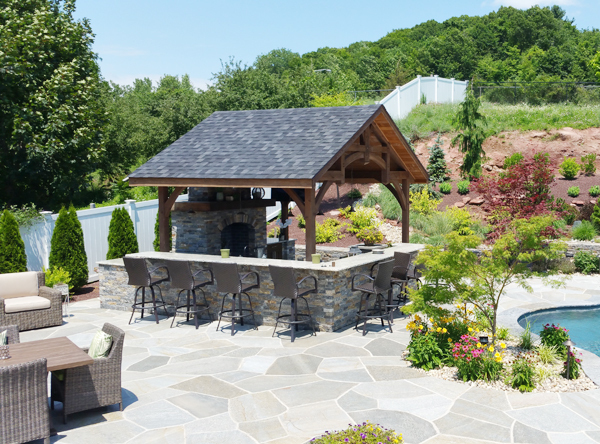 This outdoor living design build project is truly fabulous. A beautiful gunite pool with Hamptons spa spilling over into the pool. Meandering walls and columns to uphold the sloping hillside. An open air pavilion complete with a swim up bar, bronze sink, tv, EVO grill and fireplace to entertain fabulously. This poolside open air pavilion becomes the focal of living space for those wishing to spend hours outdoors beyond the walls of their home. The curved Maui like pool and stone patio lead back towards the house where a separate Outdoor Kitchen area connects the deck of the main house to the back yard pool area. The outdoor covered kitchen area allows for food, conversation, and fun 10 1/2 months out of the year. Another outdoor living fabulous space by Outdoor Kitchen Fabulous designer Michael Gotowala founder of THE OUTDOOR KITCHEN DESIGN STORE by Preferred Properties. 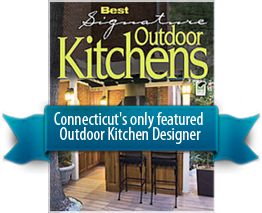 Connecticut's Best in Outdoor Kitchens. 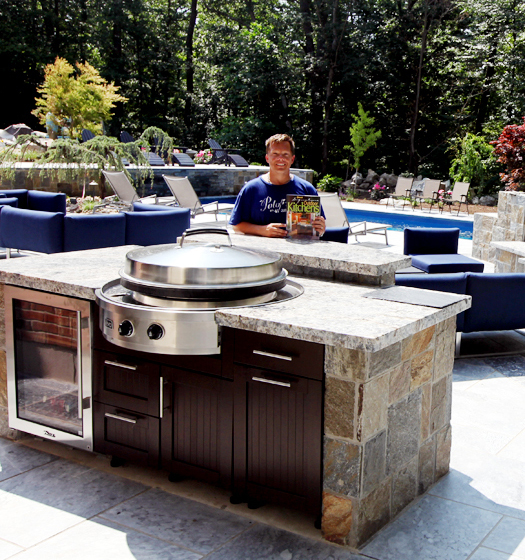 The Outdoor Kitchen Design Store located in Connecticut and Hill Street Southampton by Appt.